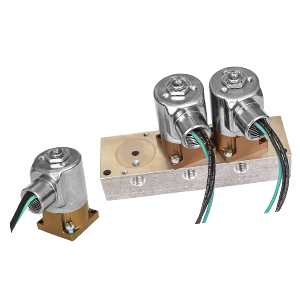 Versa E Series are direct solenoid operated valves that are available in 2 or 3-way flow functions and with or without manifold systems. 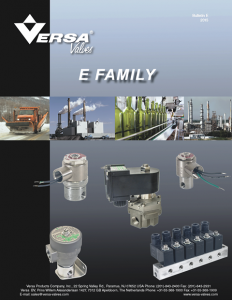 Versa E Series are direct solenoid operated valves that are available in 2 or 3-way flow functions and with or without manifold systems. Manifold systems allow for connecting common ports to eliminate the expense and time associated with additional piping and/or tubing. Manifold systems also reduce space requirements. Other solenoid and seal materials are available.